SIDSP®-Sensors - now also available in the wireless version Comfortable Apps can now turn Android smart phones and tablets into effective evaluation and measuring devices. 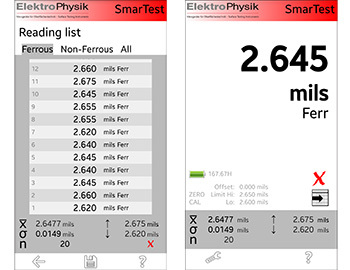 The new SmarTest concept consisting of an app and a wireless sensor offers the perfect solution for measuring coating thickness with the help of smart phones and tablets. The SmarTest version of SIDSP®-sensors to measure coating thickness combines exceptional precision in measuring and resistance to interference with the advantages of the modern wireless technology. The digitally generated readings on the sensor are relayed by Bluetooth to your smart phone or tablet. 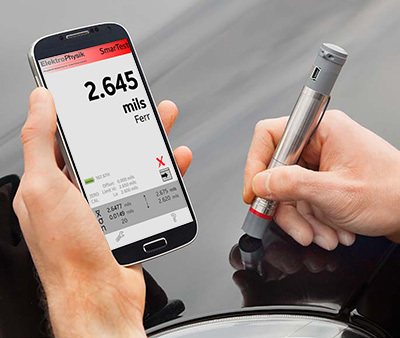 The SmarTest App functions as a device for evaluating and thus replaces a conventional coating thickness gauge. The App functions include a clear display of current measuring value, statistical evaluation, storage of measuring values in files, 2-point calibration, measuring unit metric/imperial switchover and export of the series of measurement in the CSV format. All the functionalities of a smart phone are available for data transfer. For instance, you have the ease of sending your measuring data to any receiver by e-mail. The intelligent SmarTest sensor is made to fit any jacket pocket. In combination with smart phones or tablets this forms an ultra modern full-set for experts on site to measure coating thickness. 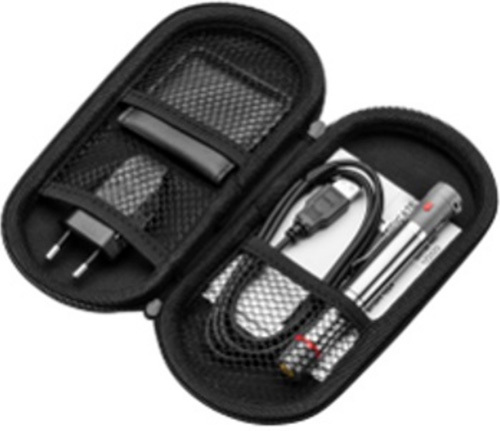 Long battery life: the sensor equipped with the LiFePo battery can function for up to 8 hours in continuous operation. Readings exceeding the set limits are indicated on the sensor's green/red LED. SmarTest functions on old smart phone models as well as on the latest ones. The dual Bluetooth module ensures a long operating time in modern devices thanks to the Bluetooth low energy mode. SmarTest is a most flexible solution: It can also be supplied in other combinations with any of the SIDSP®-sensors of the MiniTest 700 series to cover a wide field of different applications. *SmarTest F and FN are also for use with other wireless sensors.